The School of Public Affairs is proud to announce the publication of Dr. Ethan B. Kapstein's new book. He is the Senior Director for Research and Decision Analysis at ASU’s McCain Institute and Arizona Centennial Professor of International Affairs in the ASU School of Public Affairs. "Seeds of Stability" examines important questions that can help developing countries achieve stability. Under what conditions do the governments of developing countries manage to reform their way out of political and economic instability? When are they instead overwhelmed by the forces of social conflict? What role can great powers play in shaping one outcome or the other? This book is among the first to show in detail how the United States has used foreign economic policy, including foreign aid, as a tool for intervening in the developing world. Specifically, it traces how the United States promoted land reform as a vehicle for producing political stability. By showing where that policy proved stabilizing, and where it failed, a nuanced account is provided of how the local structure of the political economy plays a decisive role in shaping outcomes on the ground. 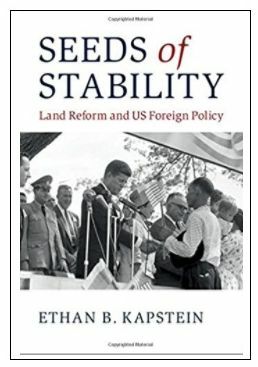 Briefly, it argues that the US sought to use land reform—and economic reform more generally—as a tool for promoting political stability in the developing world. However, the US succeeded in advancing a reform agenda only when it could incentivize local elites (say through subsidies) to move their assets off the land and into, for example, industry. More generally, I argue that the more highly concentrated are elite assets, and the fewer the alternative economic opportunities, the more difficult a reform process. This argument, of course, is highly relevant for both scholars and policy-makers who work at the nexus of development and conflict. Ethan B. Kapstein is Arizona Centennial Professor of International Affairs and Senior Director for Research at the McCain Institute for International Leadership in Washington DC, a think-tank associated with Arizona State University. He is also a Senior Advisor for Economics at the US Institute of Peace, and Associate Director and Senior Research Fellow at the Empirical Studies of Conflict (ESOC) project, a research collaborative based at Princeton, Stanford, and UCSD. Kapstein is a Visiting Fellow at the Center for Global Development and Research Affiliate at NBER. He has previously held chaired positions at the University of Texas at Austin, INSEAD, and the University of Minnesota, Ethan has also served as a Vice President of the Council on Foreign Relations, Principal Administrator at the Organization of Economic Cooperation and Development, and Executive Director of the Economics and National Security Program at Harvard University. Kapstein is a former international banker and has served as an officer in the United States Navy. A specialist in international economic relations, he has published widely in professional and policy journals, and is a frequent contributor to the op-ed pages of the International Herald Tribune and Los Angeles Times. He is the author or editor of ten books.